The University of Glasgow will take an innovative approach to guiding attendees through its upcoming open day, using a promotional Advan from Transport Media. Running on Wednesday the 4th September, the site will present prospective undergraduates with a detailed and colour-coded map of the campus, pinpointing key events scheduled throughout the day. Tracing back to the 15th century, the University of Glasgow is one of the oldest English-speaking educational establishments in the world, offering both undergraduate and post-graduate higher education in Scotland’s largest city. Over 23,000 students are registered at the university, and study is distributed across three main campuses. 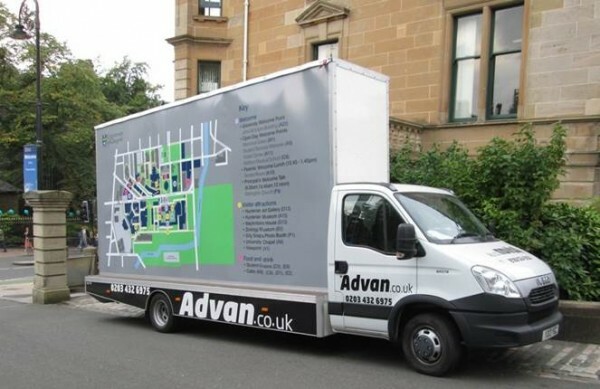 By opting for the versatile Advan platform to showcase the open day, the University of Glasgow will stand out from conventional methods such as leaflet hand-outs and noticeboards, offering visitors a distinctive information point. With clear visibility and a prominent scale, the Advan will give the university a reputation that is synonymous with high quality.